Rapidly changing weather can make or break any farmer’s livelihood, but not if they have a good weather station that can make accurate forecasts and allow for prompt actions if there is an impending weather emergency. For this alone, choosing the best weather station for farmers shouldn’t be taken lightly as these devices may include extra features that can make them even more beneficial to farmers. I’ve created a list of the top weather stations for farmers to help you narrow down your choice. Let’s start with a few key characteristics so one can make an educated decision. What Is a Weather Station for Farmers? Weather stations for farmers, or agricultural weather stations, are tools that measure and display different local measurements to ensure optimal farming conditions. They offer real-time data which can usually be observed on site or over the internet. Most of them measure wind speed and direction, pressure, temperature, rain level, and solar radiation. But the more advanced model will also include UV index readings, soil temperature and moisture, leaf wetness, and water temperature, to name but a few. What to Consider When Buying a Weather Station for Farmers? While not comprehensive, these are the features that shouldn’t be missed for farmers who are looking to get the best weather station for their farming needs. Unlike conventional weather stations, the ones for farming may come with additional sensors that can take anybody’s farming experience to the next level. While the humidity, rainfall, and temperature sensors are considered essential, depending on the type of crops grown, a farmer may also greatly benefit from soil and UV index sensors. My advice is to invest in a quality weather station with loads of sensors so you can have all your bases, and crops, covered. A good weather station for farmers come with software that allows you to analyze weather and soil data with greater efficiency. In addition, it’s loaded with historical weather data and allows for comparisons of local seasonal weather conditions to make informed farming decisions. Farming weather stations will surely be exposed to adverse weather such as scorching heat, high winds, and increased humidity. These conditions may affect the station’s performance and reliability. This is why I would always go for a unit that features enough weather protection to stand up to the weather conditions in an area. 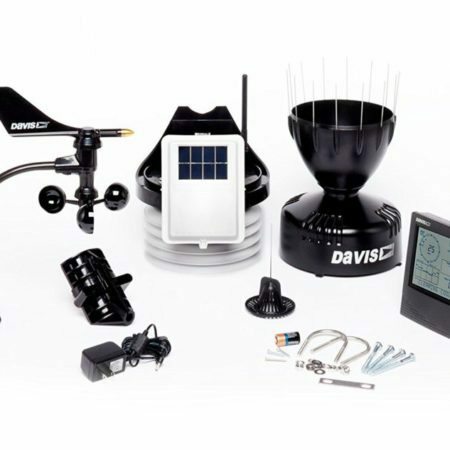 As its name suggests, the 6152 Vantage Pro2 from Davis Instruments is a top-of-the-line weather station for professional farmers. 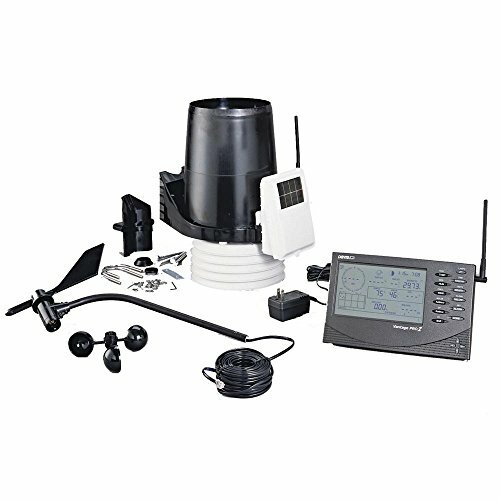 This wireless weather station comes with a standard radiation shield and a range of high-end sensors. The base package includes wind, rain, humidity, and temperature sensors. If need be, one can easily add a solar radiation and UV sensor. The included anemometer comes with a 40-foot cable for separate mounting. In addition, the 2.5-second wireless update time is among the best of all the weather stations I’ve reviewed. This allows for the quickest possible response especially in the event of sudden high winds and other unexpected weather changes. The 6152 Vantage Pro2 also has an option to connect to a Davis Instruments data logger and all the parameters can be viewed on a mobile device or computer regardless of your location. At the end of the day, the overall build quality and durability are what make this model the best weather station for farmers in my book. Each of the weather station elements has been designed to withstand temperature extremes, corrosion, and 200 mph winds. The 6250-WEATHERBRIDGE is an excellent crossover weather station designed to meet the requirements of small to medium-scale farmers. 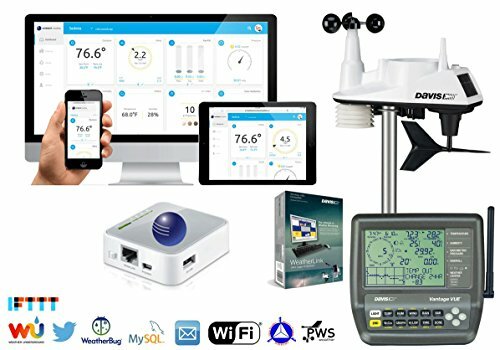 This model is basically the excellent Davis Instruments Vantage Vue weather station packaged with Ambient Weather’s quality of life features, including the Alexa-compatible Wi-Fi connectivity. To get the station online, all you have to do is couple the Weather Bridge data logger with the Davis Instruments Vantage Vue console and ensure the units are connected via Wi-Fi or an Ethernet cable. Once that is done, the monitoring and analytics options are almost endless. Some of the most useful information this neat package provides includes wind direction and speed, pressure, rainfall, temperature, and UV index. On top of that, calculated parameters like heat index, rain rate, wind chill, and dew point allow the user to configure farming needs more accurately. The wireless transmission range is up to 1,000 feet. The Vantage Vue weather station sports a 2.5-second weather update – which is among the quickest in the industry. This weather station landed on my list of best weather stations for farmers as an affordable all-around solution. 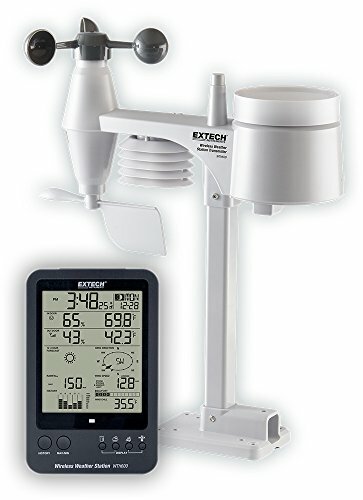 The Extech WTH600-Kit is a 5-in-1 weather station which outperforms its price in delivering precise rainfall, humidity, wind direction and speed, and temperature measurements. The WTH600 comes with a decent wireless range of about 450 feet between the sensor and the main console. The unit features alerts that warn against extreme outdoor and indoor temperature changes, sudden wind speed increases, and unexpected precipitation. A built-in memory allows the user to keep track of measurement changes and it includes time-date stamps. To measure rainfall, the unit comes with a self-emptying rain collector. An anemometer and a wind vane ensure precise wind measurements and the humidity and temperature sensors round off the basic forecasting requirements. But the thing that I like the most about this weather station is the simple installation. Despite being billed as a kit, the unit comes fully calibrated and assembled which makes the setup a breeze, even for those with no previous experience. In my view, any contemporary farm, no matter how big or small, needs a quality weather station. The specs, prices, and performance can vary significantly. However, investing in a durable and reliable weather station is bound to save money in the long run. This is why I consider the Davis Instruments 6152 Vantage Pro2 to be the best weather station for farmers. This particular model is in the upper price range. But after considering the premium feature, build quality, and customization options, the Davis Instruments truly stands out.